we offer a catering service that includes delivery to almost anywhere on the island of O'ahu! If you want something that you don't see, talk to us about it! there's almost nothing we can't do! items are charged by the portion. we estimate that one portion serves one person in its respective category. anything can be delivered hot or cold. the minimum order is 10 portions per item. arranged fruits, as local and seasonal as possible! natural meats and cheeses with greens and veggies, tightly wrapped up and cut into pinwheels. Choose From: roast veggies with hummus, turkey and cream cheese, roast beef with cream cheese. sweet and tangy wings infused with a smooth bbq sauce. they're yummy hot or cold! a platter of meats and cheeses and sandwich veggies, you and your guests can build your own custom sandwiches! each portion comes with at least 4oz of a combination of turkey, ham, roast beef, hand made mayonnaise, mustard and local bread! typically served cold, this is a platter of thinly sliced zucchini, squash, bell peppers and onions rubbed and exposed to high heat to tease out their flavor! served chilled, this makes an excellent side dish for any event! our same sandwich platter, except with grilled vegetables instead of meat. crunchy raw veggies cut up and arranged, served with a hand made ranch dressing. fun and easy 2-bite sandwiches (with no crusts of course). 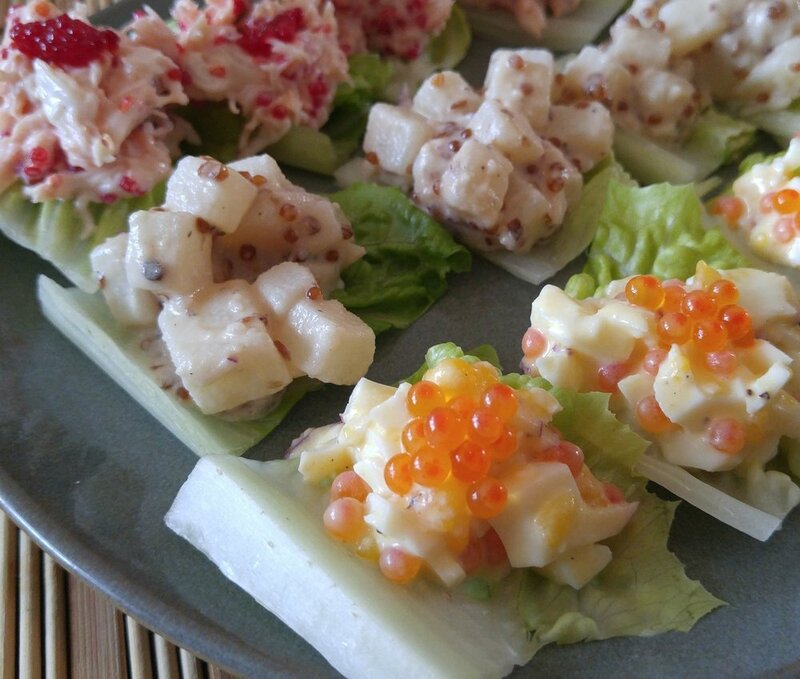 Choose From: smoked salmon with cucumber, egg salad, chicken salad, cucumber herb. classic deviled eggs made with mayonnaise whipped by hand. a light, simple chopped cabbage slaw with a hand made apple cider vinaigrette with toasted almonds and green onions. shredded kale, shaved brussels sprouts, broccoli and chicory tossed in a hand made creamy avocado cilantro vinaigrette. classic potato salad with celery, red onion, hard boiled eggs and hand whipped mayonnaise. upgrade with bleu cheese and bacon! bouncy elbow macaroni noodles mixed with bell pepper, red onion and hand made mayonnaise. olives optional. riced cauliflower with roma tomatoes, cucumber, parsley, mint, green onion, lemon juice and olive oil. seared tofu and shiitake mushrooms seared and served tossed into baby spinach dressed in a sesame soy dressing. marinated and roasted chicken breast on a bed of nappa cabbage, bell pepper, red onion, green onion and sesame seeds tossed in a sweet and savory soy dressing. Choose From: shredded chicken, pulled pork, cheese, vegan squash and black bean. each enchilada is hand rolled in a white corn tortilla and smothered in red sauce and covered in cheese (except for the vegan option). perfect for tacos! tender and juicy shredded chicken thighs cooked with southwestern flavors and seasonings. very perfect for tacos! tender, juicy, slow cooked and shredded, after being cooked with southwestern flavors and seasonings with a touch of tomato. perfect for anything, even tacos! rubbed and roasted with southwestern flavors and seasonings. turn anything into tacos with this collection of sides! one portion includes: 4 tortillas, lettuce, tomato, onion, sour cream and mexican hot sauce. either a side dish or a vegan option for tacos, this yummy southwestern seared squash is fun and yummy! each portion is a quarter chicken, so it's a great mix of dark meat and light meat rubbed in our signature garlic and fresh herb marinade. the aroma alone makes it a great choice! choose between boneless breast or thighs, our sweet and tangy chicken infused with a smooth bbq sauce is a fun and easy entree for any party! a hand crafted chili with premium ground beef (88% lean), onions, tomatoes and red beans with a special blend of herbs and spices. the chili brings the whole posse: onions, jalapenos, shredded cheese and tortilla chips. the kid brother of our beef chili, it's our same amazing chili base with the addition of garbanzo beans and corn. this chili arrives with the same entourage of onions, jalapenos and tortilla chips. shredded cheese is optional. st. louis cut pork ribs rubbed and roasted with southwestern flavors and seasonings. juicy and tender with a little bite, these are great for any event! our food truck's signature rib! it's not red because we use all natural ingredients and zero food coloring, or anything fake for that matter. the result of dozens of hours of research and development, this updated and modernized classic is sure to wow your guests! beef brisket rubbed and slow roasted with southwestern flavors and seasonings, and then rested. super tender and a little zingy, it's a very yummy dish. our food truck's signature dish! a special hand crafted misoyaki sauce fused into a very slow roasted brisket, resulting in a super tender and soft brisket with a smooth, sweet taste. this dish brings a modernized local flavor to a very traditional barbeque dish. the very best of both worlds! light and fluffy, this simple, classic dish contains 4 ingredients: potato, butter, cream and salt. premium macaroni stirred into a hand made cheese sauce and toasted. bell pepper, squash, zucchini, broccoli and onion, tossed in balsamic vinegar and roasted. simple and delicious! bell pepper, squash, zucchini, broccoli and onion tossed in olive oil and roasted. even more simple and delicious! one of our favorite dishes! cauliflower tossed in olive oil and salt, roasted and finished with a squeeze of lemon. don't forget that we have fruit platters too! can be cooked upon delivery! can also be cooked upon delivery! mini creamer potatoes tossed with rosemary and roasted. light, yummy and tender breakfast sausages. what more can we say, it's a great way to wake up! your choice of plain or vanilla yogurt with fresh berries and granola.